Invisalign Express is a faster, more affordable orthodontic option for adults who do not need the full Invisalign treatment. With Invisalign Express, patients can have mild bite irregularities corrected in as few as two to three months. Administered in five stages, Invisalign Express works well for mild spacing and crowding issues. Here is more about the unique aspects of Invisalign Express, the treatment process and ideal candidates. Patients who choose Invisalign Express for their mild orthodontic problems can count on receiving results in far less time than standard Invisalign would take, saving them money in the process. In contrast to the year or more required to complete full Invisalign, Invisalign Express requires only a few months to deliver improvements. Patients can also visit our Los Angeles Invisalign Express expert to quickly correct orthodontic relapse or mild pre-existing bite irregularities before important events, such as birthdays and weddings. Patients begin Invisalign Express treatment by visiting our expert in Invisalign Express in Los Angeles for a consultation. After designing a unique treatment plan, our dentist gives patients five different sets of aligners at appointments scheduled every two weeks. The time and cost required for treatment varies based on the types and degree of bite irregularities being corrected. Ideal candidates for Invisalign Express have very mild orthodontic issues, such as small gaps or slight overcrowding. However, only a consultation with our Los Angeles Invisalign Express expert can actually determine whether any individual patient can receive Invisalign Express at our office. 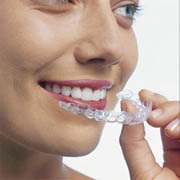 Invisalign Express is a convenient option for patients with only mild orthodontic needs. In addition to fast treatment, Express offers all of the advantages associated with standard Invisalign, including virtual invisibility, durability and ease of oral health maintenance. Patients can learn more about Invisalign Express and schedule a consultation by contacting our expert in Invisalign Express in Los Angeles.